This week’s video comes from a band that I recently came across listening to random playlists in Spotify. And what a pleasant surprise they have been. Royal Blood is an English rock duo that started back in 2013. Although, if you listen to their album, you will swear that there are more than two people in the band. Another cool thing about them is that their sound comes from a bass guitar and a set of drums. That’s it. They are like the White Stripes, but a lot heavier. I’m not sure how he does it, but the lead singer/bass player creates some amazing and unusual sounds with his instrument. I’ve listened to their entire debut album and I’m quite impressed that they can create such great music with just two instruments. So without further delay, check out this video for the song called, “Little Monster.” Enjoy! I will admit and I’m not ashamed that I still listen to bands that were popular in the 2000s. If a song has good lyrics, real instruments and a great music video, then I’m always on board. One of my favorite bands from the 2000s was a group called Silverstein. A few months ago, I started listening to their music again and I was pleasantly surprised that they are still releasing new records. In fact, this year, they will be releasing a new record called, “I Am Alive in Everything I Touch.” And I’m very excited about it. These guys have consistently made good albums without ever changing their style of music. Most bands these days decide to switch styles in order to sell more records but it usually just comes off looking desperate. Check out the new Nickelback video if you need an example of how sad it can be. But yes, Silverstein has stuck to their guns and continue to make great rock music. That’s why this week’s video is from their new album and it’s called, “A Midwestern State of Emergency.” Enjoy! Recently, I’ve been watching a lot of odd movies. The type of films where you scratch your head and at the end, you wonder what you just watched. The last three weird movies that I have seen are The Babadook, Tusk and one of my new favorite movies, Frank. Frank is a peculiar tale about a young man who joins a band with a very strange lead singer played by Michael Fassbender. (Even though you don’t see his face until the end.) 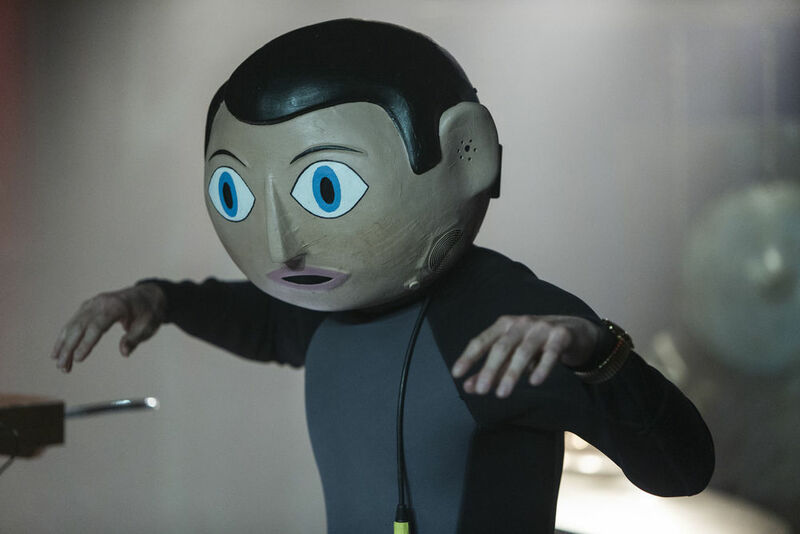 Fassbender’s character wears a giant head throughout the entire film. All the time. Even in the shower. He never reveals his face. He is also a musical genius. Here’s one of their songs. It almost sounds like a mixture of Radiohead and Jim Morrison. The whole movie is about a band struggling to record an album while they also deal with new fame and a lead singer who is mentally ill. Each member fights to remain true to themselves while their lives and music evolves. Would I recommend this movie? Sure, but it’s definitely not for everyone. I enjoyed the quirkiness and the dry humor. I also thought it had some really meaningful metaphors in it about the music business and people dealing with a mental illness. Frank is on Netflix and it’s also out on DVD and Blu-Ray. If you’ve seen the movie, tell me what you think about it in the comments section! The song is about a guy who doesn’t seem to have his life together. One point in the bridge he talks about being 26 and not measuring up to his peers. The lives of others seem to be in order and seem to be productive. That’s something I can relate to on a very deep level. You start to look around and ask yourself if you messed up somewhere along the way. Maybe you look back and see choices you’ve made and wonder where you would be if you choose differently. Maybe you’d have a wife, a family, a better job, a better place to live or just a better life in general. Maybe you’d be a better person. The thing I love most about The Wonder Years is that their lyrics are so relatable. You can feel the real emotion coming through. The lead singer asks questions of himself and examines how he could have been a better person. So here is this week’s music video. Enjoy. This blog feels like such a distant memory to me now. But I’m not here to get sentimental with you. I’m here to say, that I’m back and will be updating the blog. Lately, I’ve been trying to figure out what I want to do with my life. And honestly, I still have no clue. I have ideas of what I would like to do, but nothing has grabbed me. Nothing has been worthy of pursuing. Except writing. Writing is the one passion that I would gladly do without getting paid. That and making music. I do them both and don’t get paid and I’m okay with that. So, here we go. In this blog, I will be writing about music, music videos, news stories that interest me and random topics that I want to explore. Will anyone read this blog? Probably not. But I’m okay with that too. So to start things off, here’s a music video from a band I’ve been listening to a lot lately. They are called The Sidekicks and the song is titled, “Everything in Twos.” Enjoy. And I hope you’ll be back. Another year is coming to an end. It’s time to reflect and say goodbye to 2012 and look forward to all the things that 2013 has to offer. I’ve got my fingers crossed for hover crafts and teleportation. Stop letting me down, science! Since the year is coming to a close, I thought this would be a great opportunity to look back and share some of my top 3 favorite things. So get ready to go back in time and enjoy 2012 before she goes away. Top 3 Superhero Movies- I’m going to divide the superhero movies from the other movies because there were some films that I didn’t want to leave out. 3. The Amazing Spider-Man– I enjoyed the new take on Spider-Man. I am a fan of the original films, and I really wish they would have made Spider-Man 4. However, I did enjoy the film more than I thought. 2. The Dark Knight Rises– Even though there were some holes in the story, you can’t deny that Nolan made the best Batman films ever. I think everyone knew that this movie wouldn’t surpass The Dark Knight, but it was still brilliant. 1. The Avengers– Finally! Marvel really got this movie right. Sure, Batman was good, but this movie was amazing. We finally got to see the film that Marvel has been building since Iron Man and it was worth the wait. 3. End of Watch– This cop drama/documentary style film was really enjoyable. The cast was great and the ending really hits you hard. 2. Looper– I thought this was a pretty good sci-fi film that really looked at time travel in a new way. Joseph Gordon-Levitt and Bruce Willis did a really good job with the characters. Also, Emily Blunt is beautiful and one of my favorite actresses. 1. Flight– Two words. Denzel Washington. This movie dealt with a pilot and his alcohol problems that led to him being investigated after he landed a faulty plane in a field. Washington’s performance was one of his best. Also, just to clarify. There were some other movies that could have potentially made the list, but unfortunately I didn’t get a chance to see them quite yet. 1. Jack White– Blunderbuss- Just a side note, I love how on his website, he has posted a few of the negative reviews. 2. The Walking Dead– Season 3 was pretty amazing. I loved how the group took over the prison and I was really happy that a certain character is no longer in the picture. The 2nd half of the season starts in February and I’m so excited. 1. Breaking Bad– This is quite possibly one of the best shows ever created. The writing and acting is brilliant and you really get sucked into the show. What’s really crazy is that you cheer for Walter White even when he starts turning into a monster. If you haven’t seen this show, I can’t tell you enough to jump on the train before it all ends this summer. You’ll love the ride. What were some of your favorite things from 2012? Be sure to share your thoughts in the comments section or on the Facebook page. 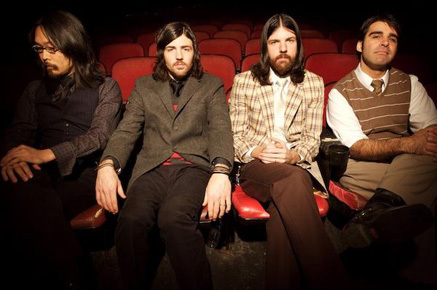 This week’s music videos comes from one of my favorite bands, The Avett Brothers. Today, they are releasing their new and highly-anticipated album, The Carpenter. These guys are truly a rare find in the music scene. They have a unique sound and know how to rock a stage with just a guitar and a banjo. If you ever get lucky enough to score tickets to one of their shows, do not miss it. They are one of the greatest live bands you will ever witness. There new album is coming out today, so definitely check it out. You won’t be disappointed. This week’s music video comes from a band that has been entertaining the masses for over 3 decades. Even if you don’t like their music, you have to respect them for what they do. I’m of course talking about the Red Hot Chili Peppers. They’ve satisfied our ear drums with hits such as “Give it Away,” “Scar Tissue,” “Under the Bridge” and more. They’ve just released their 10th studio album,”I’m With You” which has been nominated for a Grammy. I’m pretty sure this is my favorite song off the new record, so sit back and enjoy. I’ve decided to add a new part to my blog called Video of the Week. When I was younger, I use to love watching music videos, but nowadays there really isn’t an outlet for that. Mtv has turned it’s back on musicians and has become a breeding ground for reality TV. So I’ve decided that every week, I’m going to post a music video that I really enjoy. Feel free to give me your suggestions in the comments and I’ll be sure to check them out. I love checking out new music and hearing from new bands. Anyways, this week’s video comes from a band called Fight the Fear. They covered a song from one of my favorite bands, Envy on the Coast. If you’ve never heard Envy’s music before, you need to do yourself a favor and check it out. They did recently break-up, but their albums Lucy Gray and Lowcountry are still amazing. I think these guys did an amazing cover of this song. I love the girls voice and the instruments are pretty much spot on. Let me know your thoughts and opinions!